I have been travelling a little lately, hence the lack of any new entries. 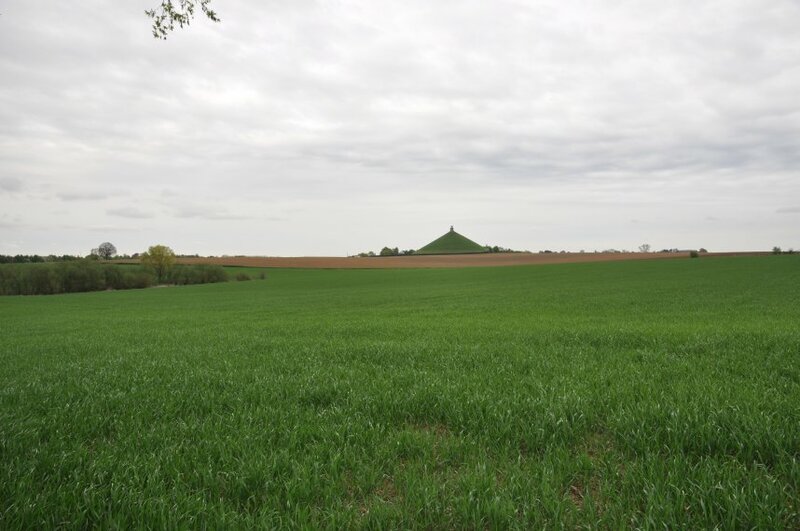 Last week I visited the battlefield of Waterloo and here is one of the pictures taken on a drizzly day. This was taken from the edge of the Chateau of Hougomont, looking towards the position of the ridge, marked by the Lion Mound. It was over these fields that the grand Fremch cavalry charges were delivered on the 18th June 1815. Being there makes you realise just how densely packed the squadrons must have been. On the day the ridge was markedly higher, but sadly the construction of the monument drastically altered its shape. Still, it does make a good viewing platform. For those in the UK, BBC2 are repeating Kate Williams' Timewatch documentary about the early life of Queen Victoria this Saturday at 8.35. It's well worth catching. With the Easter holidays just past, no doubt lots of TV stations have rolled out some of the old Hollywood epics. As a kid I used to sit watching these, waiting excitedly for the scenes with Roman soldiers and then complaining that their armour and equipment was wrong! These days I do not get upset quite so easily. It is interesting though that even dramas or documentaries that say they want to get things right always tend to depict the soldiers at the crucifixion as legionaries. They usually have the famous segmented armour, a semi-cylindrical rectangular shield and carry the pilum. Judaea was a minor province governed by an equestrian prefect - the title became procurator c. AD 40. Equestrians were the social class below the sentorial order. There were thousands - probably tens of thousands of them - compared to about 600 senators. Apart from in Egypt, legions were always commanded by a senatorial legate. Since a senator could not serve under an equestrian, no legionary troops were stationed in Judaea. Instead the garrison consisted of auxiliaries. These were not Roman citizens, although they gained Roman citizenship at the end of their twenty-five years of military service. Many of the men in the army in Judaea are likely to have been Syrians. Their centurions may or may not have been Roman citizens, but were often local men. The prefect or tribune commanding a cohort would have been both a citizen and an equestrian. Later in his career he might rise to govern an equestrian province, although the majority did not achieve this. Jerusalem normally seems to have had a garrison of a single cohort - probably 480 men, although in the Book of Acts there seems to be a mixed cohort containing some cavalry as well as infantry stationed there. The prefect spent most of his time at Caesarea, which was an overtly Gentile city. He would go up to Jerusalem for volatile periods like the Passover and take another cohort or so with him. Josephus tells us that when Pontius Pilate did this for the first time there was rioting because his men brought their standards - including the imagines which were images of the imperial family - with them into the Fortress of Antonia which was built onto the corner of the Temple. Anyway, auxiliaries wore a different uniform to legionaries. They carried a flat shield, usually oval, but sometimes rectangular, wore mail or scale armour instead of the segmented cuirass, and carried one or more spears (such as the lancea) instead of the heavier pilum. Roman soldiers of all types frequently performed police duties, including carrying out executions. Whether they would wear full equipment at such times is unclear. A soldier would anyway be marked out by his hob-nailed boots (caligae) and the weapons' belt which girded his long tunic up around his thighs. Still, I suppose the classic legionary is immediately recognisable as a Roman soldier, and that is probably all that will matter to film or TV producers. Just be nice if someone would get it right sometime! I have been travelling a lot recently - hence the lack of any new postings. Most recently I attended the Hadrianic Society's annual Roman Army School held up in Durham. This is always a lot of fun, with a very good mix of academics, a few students, and enthusiasts from every walk of life, most of whom have remarkably extensive knowledge of the subject. The atmosphere is always friendly, making it a marvellous place to bounce around new ideas. This time we had reports on the Antonine Wall, which UNESCO recognised as a World Heritage Site last year. Hadrian's Wall received this status some time ago. One stretch of the Antonine Wall is already under threat from development, so hopefully this will help to ensure its protection. There was also an update on recent discoveries from Roman Scotland, as well as lectures on various campaigns and battles. As yet we do not have a date for next year's conference, but it will be sometime round Easter. A couple of new links have been added to the TV and Media page on the website. I came across some more videos of the short pieces I did to introduce the HBO Rome Series on Discovery Channel. There is also a link to a radio interview I did for On Point on WBUR Boston. It is the mark of a good host that he can put you at ease when you are sitting alone in a studio on the oppposite side of the Atlantic! This time we have another break from ancient history � and even from military things, although the author is a friend so in some ways it�s back to earlier entries � but with the film Young Victoria just out in the cinemas, I can only recommend people to read Kate Williams� Becoming Queen which has just been released in paperback. I read the hardback when it came out last September and enjoyed it immensely. The book has a great pace, is written with sympathy for all the characters, understanding rather than simply condemning them, and brings the age to life. It is really two stories in one � the first of Princess Charlotte, the Queen who never was, and then of Victoria herself. I must confess I knew next to nothing about it all, and was only dimly aware of Charlotte�s existence. Kate has one of the most natural and lively styles of anyone writing history or biography today and really knows her subject. It�s a terrific read, and a remarkable story set against the gaudy and self indulgent world of Regency High Society � and no one was more gaudy and self indulgent than George III�s sons who spent a lot of time with their mistresses, but struggled to produce a legitimate heir. Victoria gave her name to the age that was to come, which always seems so very different that we forget many people lived through both, and it is well worth reminding ourselves that it took a complicated chain of events for her to be crowned at all. I saw the film Young Victoria earlier today. It looks very good, and is a diverting enough way to spend a couple of hours, but it is very much a series of loosely connected scenes, and does not go in to much depth. Emily Blunt is good, although maybe doesn't quite look eighteen at the start. Becoming Queen is well worth reading for anyone wanting to know the true story, whether you see the movie or not. It simply brings the age to vibrant life in a way the film does not manage. It is also well worth getting if you just like a good story, very well told. Hopefully the BBC will repeat the Time Watch episode Kate presented telling Victoria�s story and showing us many of the key places from her early life. Strangely if you go to amazon uk and do a search in books for Becoming Queen then my book on Caesar comes up as the fifth or sixth choice. Still can�t figure that one out, but am happy to be in such good company. 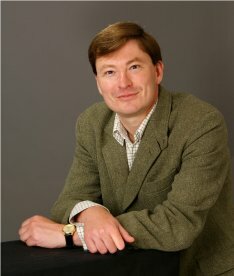 As highly recommended is the same author�s first book, England�s Mistress: The infamous life of Emma Hamilton, which in many ways is an even more bizarre story, and takes the reader on a journey through England and Europe in the later eighteenth and early nineteenth century � this time theatres and brothels as well as palaces and castles!